The forest’s night which usually holds a silence was strangely agitated tonight. The location, where all of the 700 elves are encamped, has become bright with the lit-up illuminations of the bonfires albeit it being only at that place within the dark forest. It completely looked like a lone island within an ocean. Elves are able to see even in the night. Many humans believe that, but in reality it’s only a few who can. As the elves’ eyes are able to see the differences in temperature, it’s by no means like they possess an eyesight to see through the darkness of night. And thus lights were indeed necessary no matter what if it turns into a battle during the night, moreover a large-scaled one. In the perfect darkness the large army of monsters doesn’t look like anything but a red mass. The wind, which is sweeping through the trees, is tinged with the stench of iron rust and rot. Sometimes sounds of trees being smashed are weaved into it as well. Elves generally have good ears. It’s not like their long ears are particularly elegant. For those living within the forest it was extremely convenient to perceive changes in their vicinity or to sense danger by hearing distant sounds, but currently the elves cursed this quality of their ears. The large army of monsters was approaching to the place where the elven garrison has drawn the defence line from a place roughly several kilometres away, however the elves are able to hear the disgusting sounds of their swords and armours rattling as well as their moans and footsteps. And they are able to hear the loud breathing of their elven comrades standing next to them. I will definitely die tonight in this place, was the thought which dominated the elves. Without reinforcements or a refuge, they will likely be killed gruesomely in a way that is only limited by the capability of their imagination. Nevertheless, by killing many per soldier in this place, they believe that with stalling the enemy even a second longer, it will result in help towards the residents who are evacuating in the rear. There’s no one who breaks down or tries to run away. If it was a human army, it was likely they wouldn’t be able to do such a thing. Since they have lived for more than a few decades albeit being young elves, they are far calmer than humans in regards to such aspects. Resolving themselves, each of them tightly grasps their weapon. It was at that moment that the ears of the elves, who are lying in wait and are eagerly awaiting the arrival of the enemy, heard the footsteps coming running from the back. There are no plans for reinforcements to arrive. There shouldn’t be anyone coming from the direction of the city, but the elves undoubtedly can hear those footsteps approaching. Several of them turned their heads to the rear wondering who it was. The one who made an appearance from within the darkness was Renya who gave a little girl with a maid appearance a piggyback for some reason. While the elves were noisy wondering who he was, Renya shouts a second time with a slightly irritated voice. The one who stepped forward from within the lined up elves was a woman with a tall stature compared to the other elves, blue eyes and blond hair with a short-cut hairstyle. She wears similar gear to what Kurowaal wore, but at her waist is a small cane, likely the type of item called a wand, hanging. It was Kurowaal who rushed over while raising a voice of surprise. She didn’t carry a weapon at the time he saw her in the city, however now there is one rapier each hanging on the left and right side of her waist. Renya grabbed the head of Kurowaal, who had approached, in the style of an iron claw with his right hand and began to constrict it with scraping sounds. Kurowaal struggled in a panic to tear off the hand of Renya with pain travelling through the temples of her forehead, but she whines as she is unable to move at all with their difference in physical strength. A bit scorn is packed into those words. Skrod addresses Renya bluntly. A greedy human who came to just recover Kurowaal due to his desire to get a reward, that’s probably how I’m seen, Renya smiles bitterly. Certainly, that’s the easy way, but before I was to do such thing, I would have abandoned them altogether, he isn’t able to say that though. Skrod flatly denies Renya’s words. Renya laughs scornfully at that. Renya retorted to Skrod, who said that there’s no such method, that there is actually a way. Apparently Skrod immediately felt inclined to listen to Renya after he made that statement. It didn’t look like the words of the soldier, who said that she puts priority on utility, were a lie. Renya’s suggestion was reasonable if you talk of a justified measure, but Skrod immediately denied that. He cuts off and discards Skrod’s objection with a brief comment. Skrod’s expression becomes huffily, but Renya hasn’t the spare time to worry about that. In any case, with the enemy approaching in front of our eyes, it’s necessary to act quickly. Frau, who was riding on Renya shoulders, puts both her hands into the pockets of her apron dress and takes out their contents. What she was holding in both her hands was thumbnail-sized magic gems. 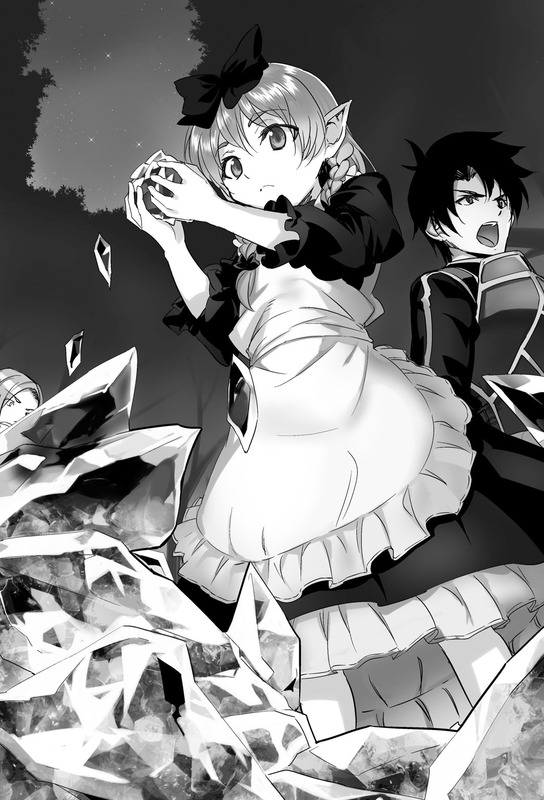 With Frau’s small hands around 10 gems were apparently the limit of what she could hold even if she used both hands, however it should still be a reasonable aggregate amount of mana. However, Skrod shakes her head. Frau unfastens the sleeve button of her apron dress. Once Frau faces the largely opened armhole towards the ground, an amount of the same sized magic gems as those that Frau took out from her pockets, as if it was some kind of joke, drop out. As expected, Skrods expression stiffened and her eyes turned into dots due to the amount of magic gems which began to create a mountain, albeit a small one, while making clinking sounds. Being called an idiot, Skrod comes to her senses and starts immediately to hurl orders at her subordinates. At that moment the soldiers promptly pick up the magic gems, which have formed a mountain close to reaching one’s waist, from the ground, split up and start to pull back, though slowly. From the point of the monsters’ views, it might be seen as them drawing back due to being scared. After the elves drew back, thin, long weeds began to grow thickly in a noisy way in a quite wide area. Trees, which have short thorns, and long vines begin to sprout in order to close the gaps. Renya, who released Kurowaal from the iron claw, slowly retreats in the direction of the city together with the elves while being dragged by his arm. Kurowaal advances next to him. Kurowaal said while looking over her shoulder at the vegetation growing one after the other in her back. Skrod will have 200 of the 300 infantrymen devote themselves to the maintenance of the barrier. She planned to hold the encampment with the remaining 100. She intended to have the 200 archers and 200 students to work on the offensive, but one can’t expect much results from the 200 students. And she didn’t believe that she will be able to prevent the 20.000 monsters from breaking through the barrier with 200 archers either. Once Renya, who is still giving Frau a piggyback, said so, Skrod nodded right away. She had the soldiers assemble under the assumption of a total annihilation in the first place. On top of having received a pointer on how it’s possible to them to return alive, even if it’s only a part of them, she isn’t in a position that she could complain either. Renya asks while looking up. Frau nods at Renya’s words. The expression of Skrod, who heard that, changes into shock. The amount of magic gems, which earlier produced a mountain, held a number that they could distribute around 10 gems to every soldier. Given that the side of the soldiers, who will deploy the barrier, will use a lot of mana no matter what, the distributed amount was biased towards them though. Even so, her statement means that she can put out around the same number of magic gems once again. Somehow Skrod’s shock becomes stronger than her surprise at that point. He didn’t attempt to go past his limit, but that amount was pretty much possible. That’s what Renya completed confirming. Skrod remains mute with her mouth flapping open and closed unable to decide either way. Kurowaal, who was accompanying them at Renya’s side, was already incapable of following the conversation. She has entered a stance of giving up and ignoring it. With a mere rapid fire of <Magic Bullet>, it probably won’t be only the monsters who will die, Renya murmurs into his chest. It looks like Skrod herself is fully aware that it will be endless if she started to question why and how. And, there’s currently no point in asking Renya about that either. Kurowaal has an expression as if she had given up on various things, but even so she puts it into words and gives Renya words of gratitude. “What, that’s only natural”, Frau throws out her chest in pride on top of Renya’s head. Even while dropping her shoulders crestfallen, Kurowaal began to feel like they will really be able to survive for some reason. Let the blood slaughter begin! 20.000 vs 200 ? What tis? A 300 Spartan Movie? Thanks for the chapter. I like how this battle strategy. I wondering if there is perhaps like a person or creature with a mind control ability that is directing where the monsters are attacking? Interesting. Let’s see how this goes. Thanks for the chapter. If the elves in this city survive this assault intact, I would expect an emergence of a third power due to Frau. The conservatives and the reformists will face a new threat of “loli maid-san” fetishists, worshipping Frau as their goddess of victory. There will be a period of chaos as these three wage war against each other’s ideals until either only one remains or they learn to accept that all breasts are equal, no matter the size and shape and turn into an utopia for breast lovers. Lmao. When I read your first sentence, I thought you were talking about an actual third power. I’m sure the author will use the flat vs big for comedy later on in the story. The rewward will be regular supply of soja beans throught the gate, lol.